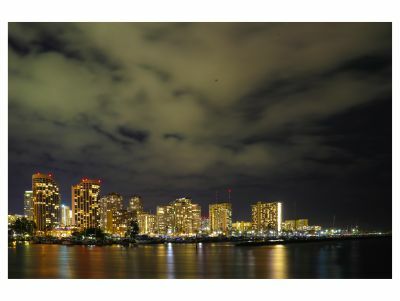 Description: Bid on this one night stay at the Moana Surfrider, a Westin Resort in Waikiki - Ocean View Accommodation. 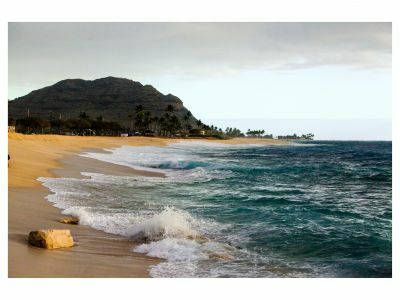 Includes taxes, daily resort charge and self parking for one vehicle. 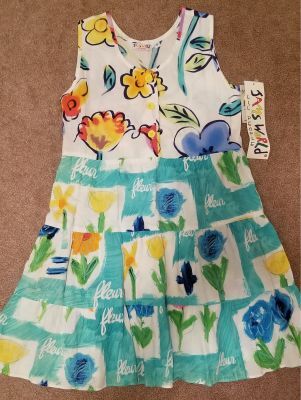 Restrictions: No cash value. 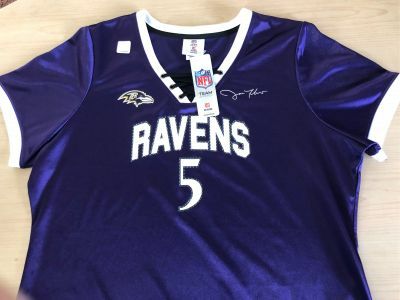 Expires April 6, 2020. Subject to availability. 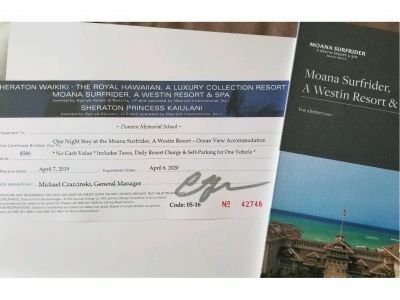 Please see voucher to make reservations and for additional information. 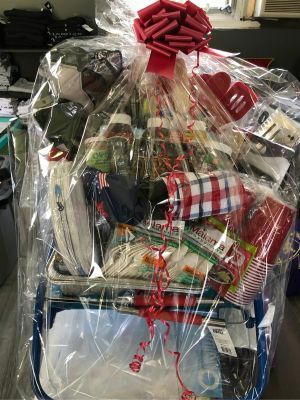 Description: This amazing Grade 10 Homeroom basket includes everything you need for your tailgate party. 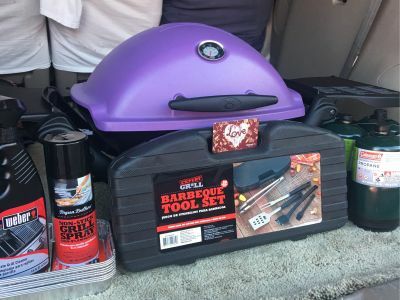 The Weber Grill comes assembled and complete with BBQ tool set, propane tanks, cleaner, drip pan, non-stick grill spray and a $50 Walmart gift card to buy items to grill. 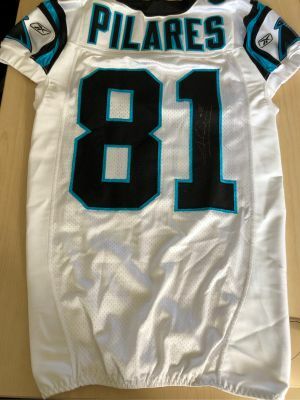 Description: Authentic NFL Carolina Panthers Number 81 jersey, signed by Damien graduate Kealoha Pilares '06. 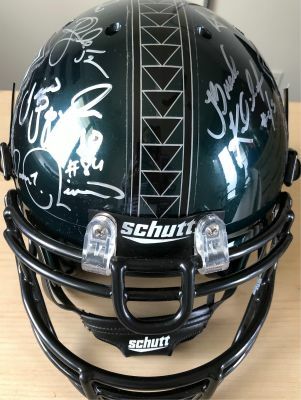 Description: Autographed UH helmet by Damien graduate Kealoha Pilares '06. 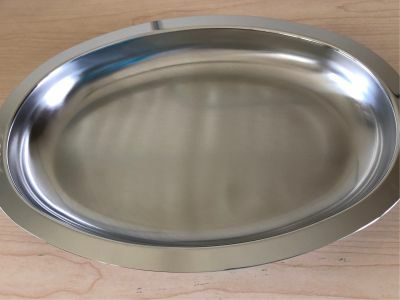 Description: Saladmaster stainless steel oval baking dish. 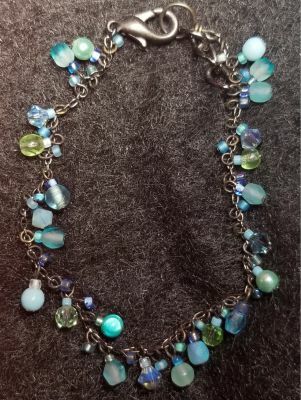 Beautiful as well as durable for entertaining. 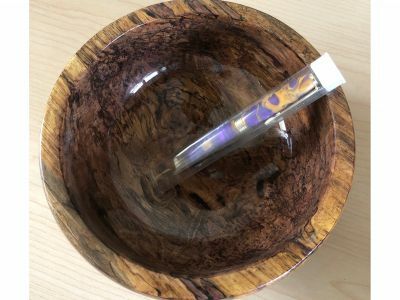 Use as a tray for serving snacks, carving meats, or to bake specialities such as lasagne or casseroles. 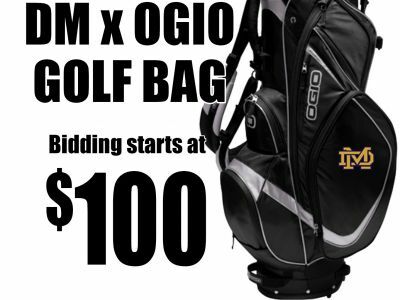 Description: This Golf Bag has an 8-way Woode top Triple Triangle suspension shoulder strap system, 6 zippered pockets, fleece lined valuables pocket, walking accessible water bottle holster, hook and loop glove patch, padded back for ventilation and rain hood. DM logo embroidered on detachable pocket. 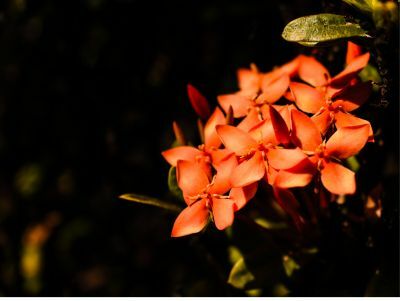 Description: Want to start yoga practice or perfect your poses? 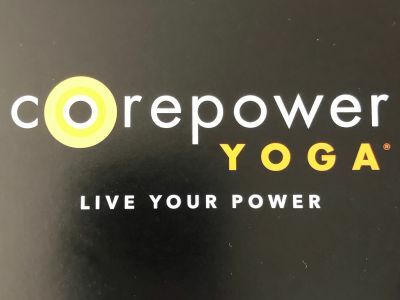 Enjoy one month unlimited yoga at CorePower Yoga studios. 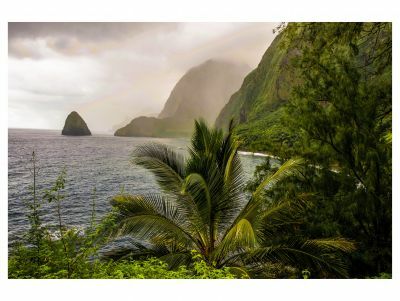 Description: Paradise Cove Luau - Orchid Luau Package for 2 guests. 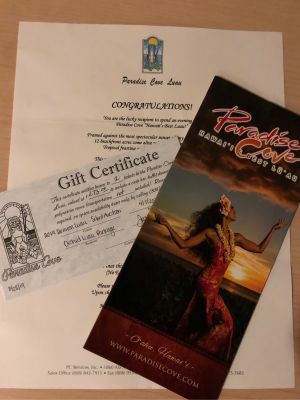 Includes: Fresh flower Lei and Mai Tai punch greeting, Cove card, Orchis luau seating, all you can eat Hawaiian luau dinner. 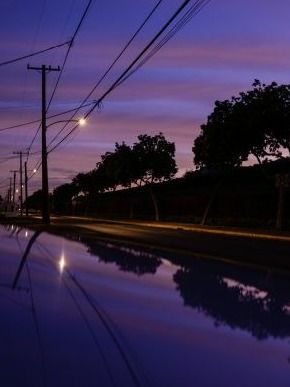 Restrictions: Reservations are required, Black out dates may apply. 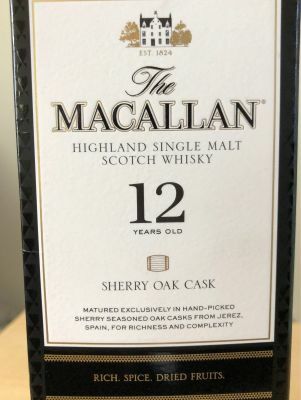 Expires April 7, 2020. 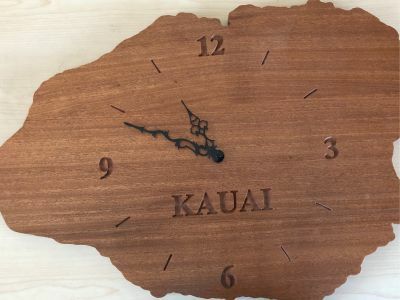 Description: Exquisite, handmade, 20" X 30" Kauai shaped, koa wood, wall clock. 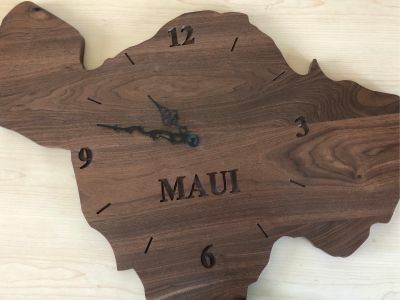 Description: Exquisite, handmade, 20" X 30" Maui shaped, walnut wood, wall clock. 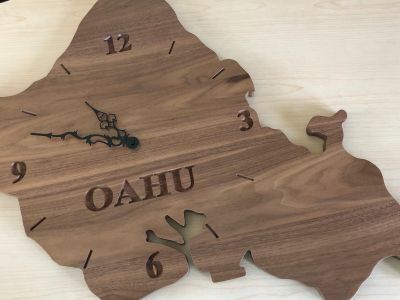 Description: Exquisite, handmade, 20" X 30", Oahu shaped, walnut wood, wall clock. 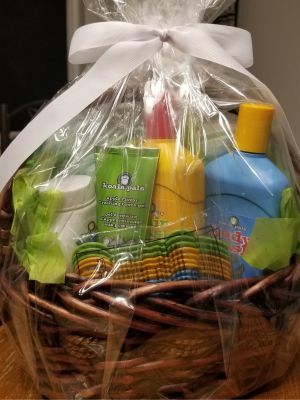 Description: Go shopping with gift cards at Longs, Safeway, Foodland, Jamba Juice, Starbucks and many more and then relax with the wine and chocolates in this basket. 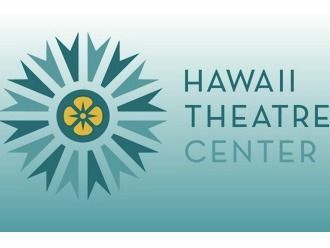 Description: Sunday Bufftet Brunch for 2 at Halekulani, Orchids restaurant. 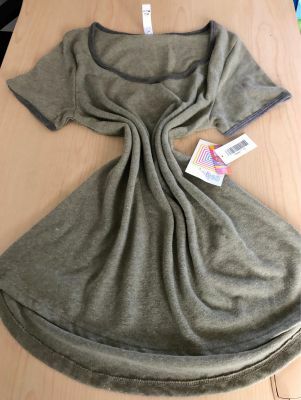 Included is a bottle of SILK wine. 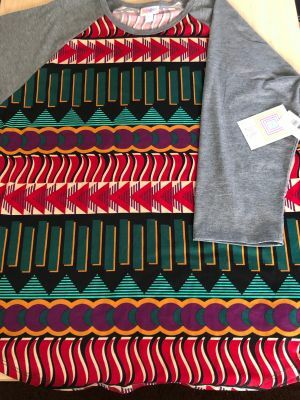 Description: Have you always wanted to own a designer handbag? 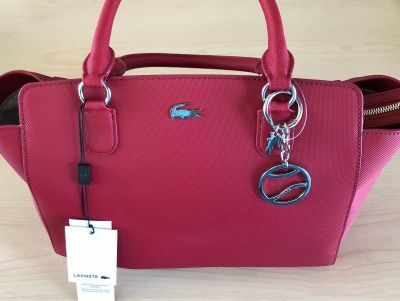 Bid on this Lacoste garnet shopping bag. 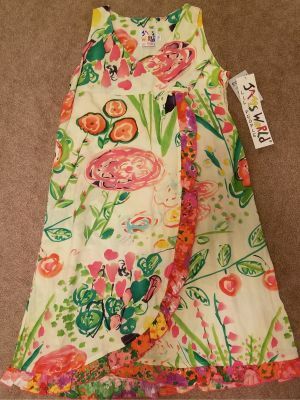 Comes with shoulder strap and cloth bag for protection. 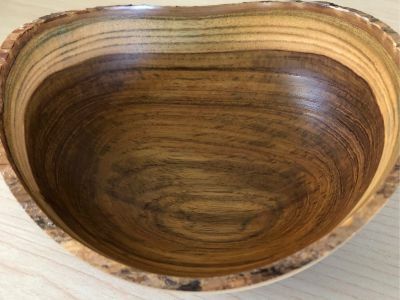 Description: Hand carved teak wood bowl. 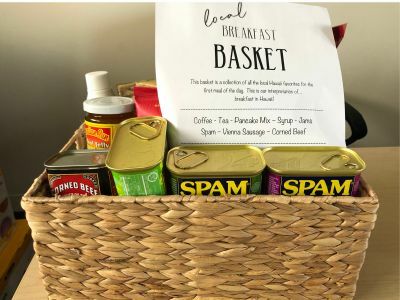 Description: This basket contains everything you need to host a barbecue at home, at the beach or at the park. Description: Intelligent brush to clean like your dental professional recommends. 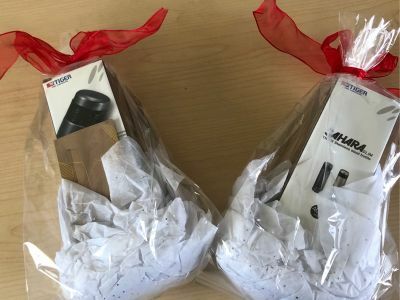 Comes with handle, charger, 3 brush heads, travel case, smartphone holder. 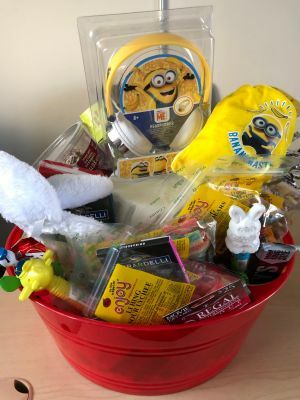 Description: Enjoy these Despicable Me Headphones, Regal Cinemas gift card, headband, candies and snacks. 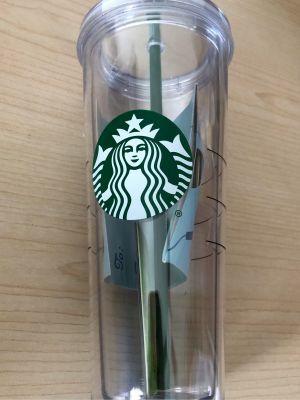 Description: This Starbucks drinking cup contains gift cards from Starbucks, Jamba Juice and Best Buy. 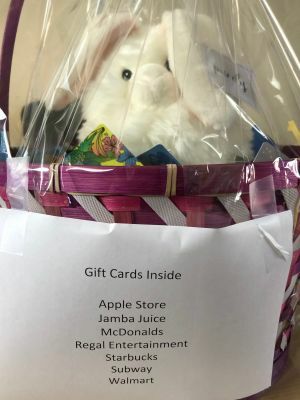 Description: Have a happy Easter with this cuddly bunny surrounded by a variety of chocolate eggs and gift cards. 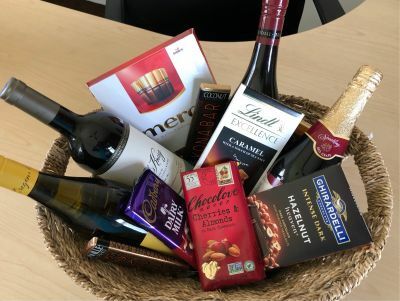 Description: This basket is for wine and chocolate lovers. 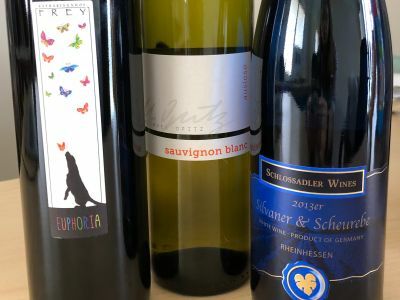 Included is a 2016 Charles Krug Cabernet Sauvignon, a 2017 Meiomi Pinot Noir, a 2017 Oregon pinot Gris and some sparkling grape juice for the kids, along with a gourmet selection of chocolates from Europe and USA. Description: This large blue bin contains everything you need for a fun day out. 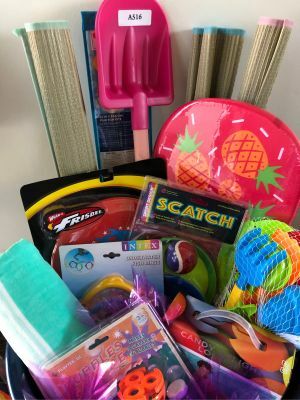 Included are: Blowup lounger, kite, bubbles galore, kick board, beach mats, towel, frisbee, scatch and other beach toys. 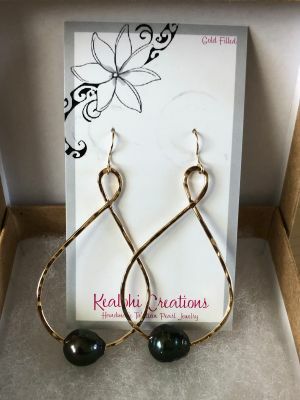 Description: 14K Gold Filled Earrings with Tahitian Black Pearls by Kealohi Creations, Handmade Tahitian Pearl Jewelry. 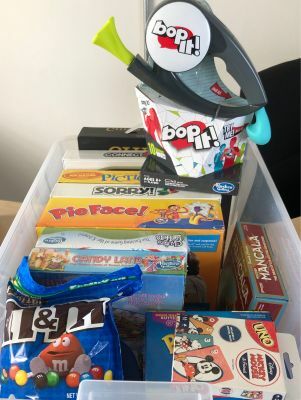 Description: This bin contains a multitude of games for a no-phone family night at home! 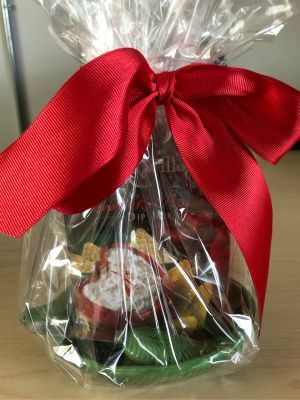 Popcorn included! 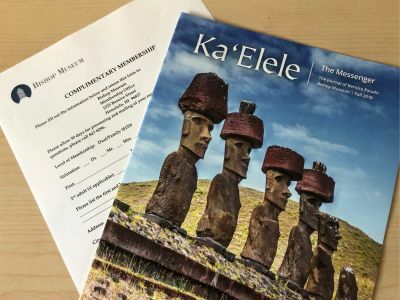 Description: Become a member of the Bishop Museum with this complimentary membership for one year. 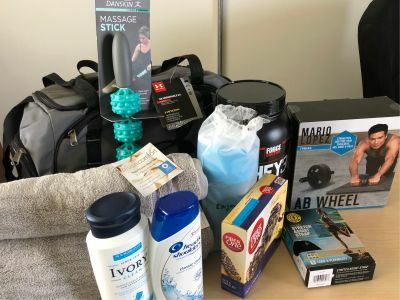 Description: This Damien Under Armour gym bag includes: Ab wheel, massage stick roller, stretch assist strap, bath and hand towels, shampoo and body wash as well as protein powder and shaker, Fiber One bars to give you energy before, during or after your workout! 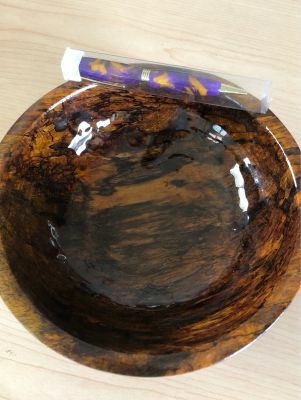 Description: Here's a chance to take home one of three unique handcrafted mango wood bowl. 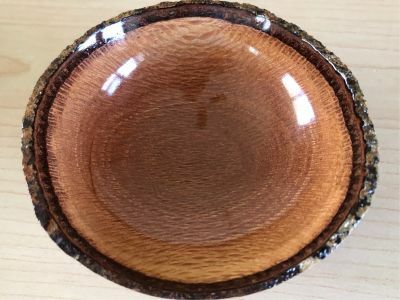 Each one is individually hand carved. 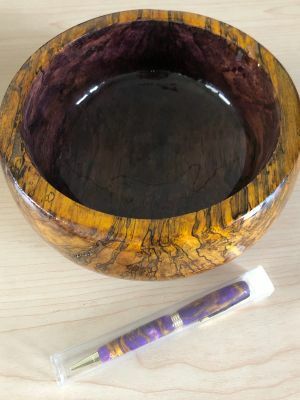 Included is a Mesa style marbleized mauve and gold pen with gold trim. 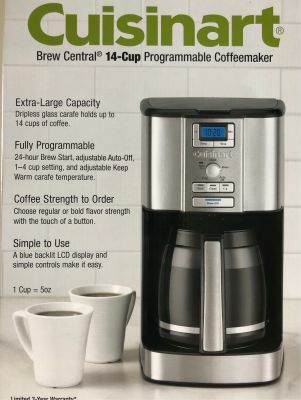 Description: Love coffee? 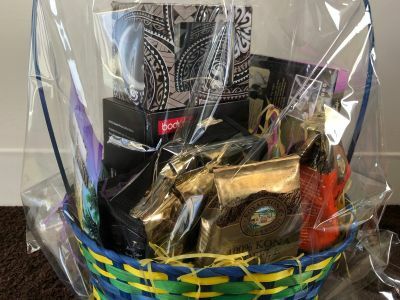 This basket contains a Bodum, 8 cup, KENYA, French Press Coffee Maker, a tribal fish hooks patterned mug, a selection of coffees and chocolates. 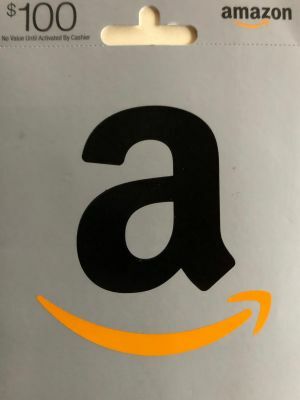 Description: Order yourself something special with this $100 Amazon gift card! 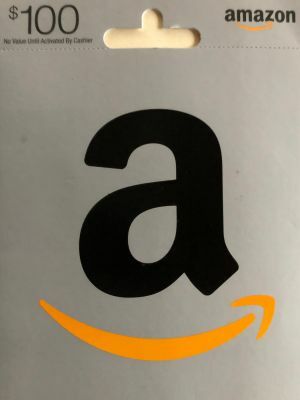 Description: Treat yourself to something you always wanted with this $100 Amazon gift card! 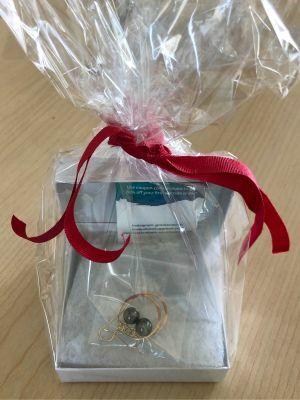 Description: H.P.R.A. 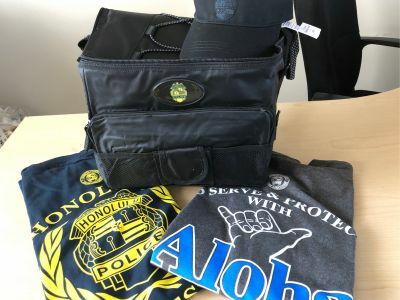 18 pack cooler bag, 2 T shirts, size XL, visor and decals. 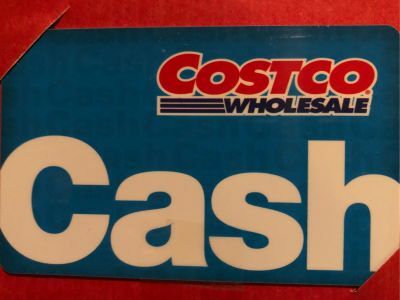 Description: Looking to stock up or just shop for your favorite Costco foods? Here's your chance with this $100 Costco gift card. 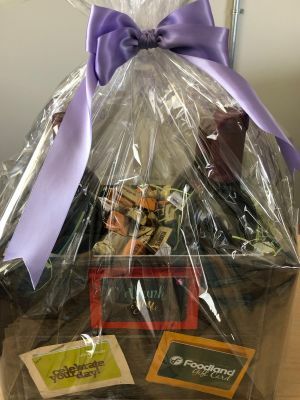 Description: Want a shopping spree at Costco - here's your chance with this $100 Coscto gift card. 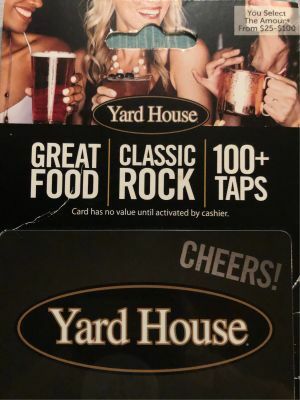 Description: Great Food, Classic Rock, 100+ taps, take yourself to the Yard House in Waikiki with this $100 gift card. Description: Want to try scuba diving? 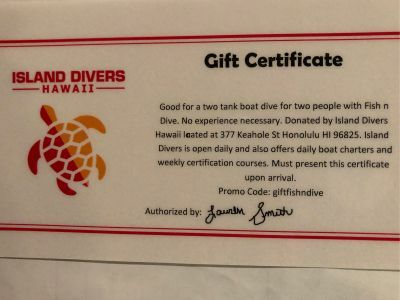 No experience needed for this tank boat dive for 2 with Fish-N-Dive! 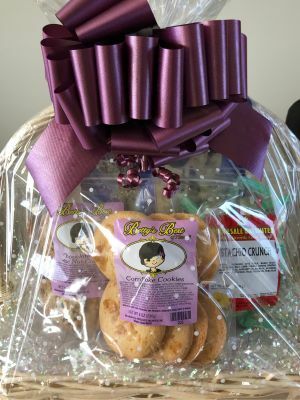 Description: Enjoy this basket filled with sweets and sweetness! 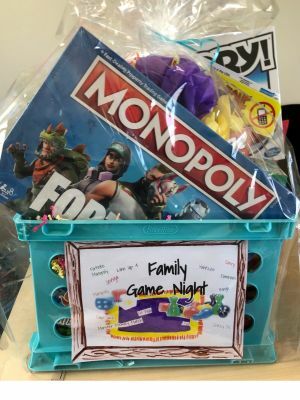 Description: This contains a selection of DVDs, popcorn, candies and snacks and even earphones for the ultimate movie night. 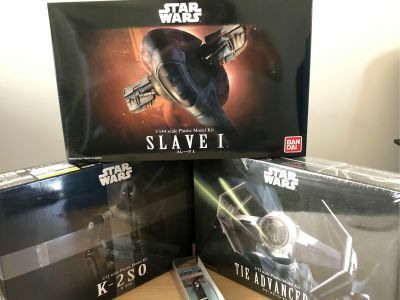 Description: Do you enjoy creating plastic models? This basket has 3 Star Wars models ready to be assembled. 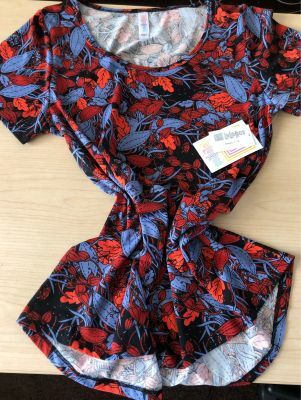 Comes complete with nippers to cutout parts and additional instructions. 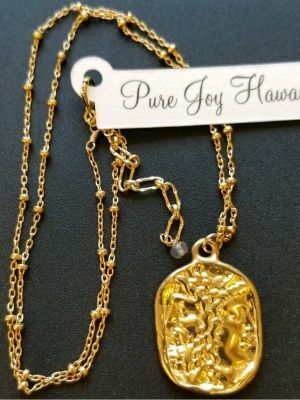 Description: Vermeil Roman medallion necklace, with 22K satellite chain. 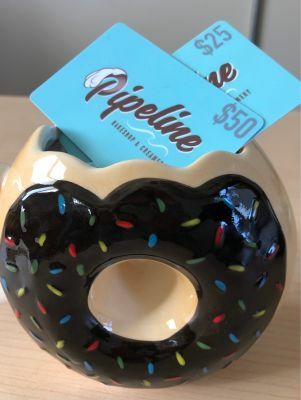 Description: Use this donut shaped mug with $75 of gift cards from Pipeline in Kaimuki, to enjoy coffee in a "hole" new way! 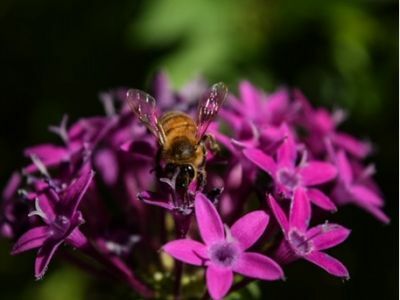 Description: Framed photograph taken by students of Mr Pablo's Photography Class. 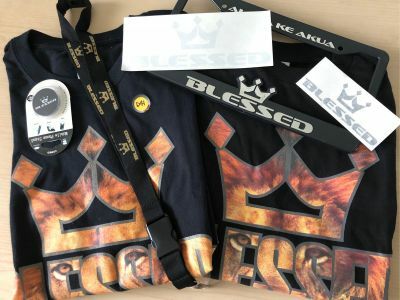 Description: The Blessed Life Presents: 1 Large Long Sleeve Shirt & 1 Small Long Sleeve Shirt Complete with a license plate cover, bumper stickers, cell phone pop socket & lanyard! 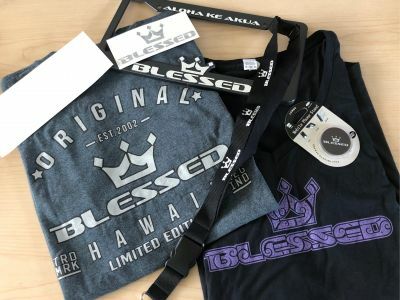 Description: The Blessed Life Presents: 1 Medium Blessed T Shirt (unisex) & 1 2XL Women's Blessed Shirt Complete with a license plate cover, bumper stickers, cell phone pop socket & lanyard! Description: You'll never leave this umbrella behind on a rainy day! 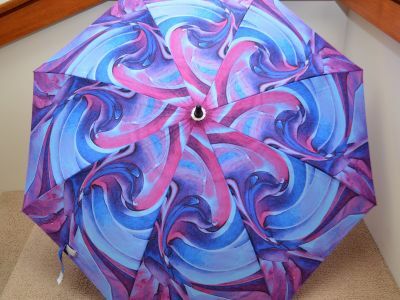 Carry with aloha, this beautiful naupaka swirl print umbrella from the Robert James Collection. 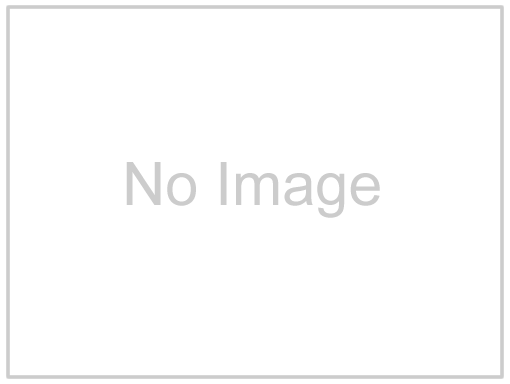 Description: A collection of bestselling books from the Manga series sold in millions worldwide. 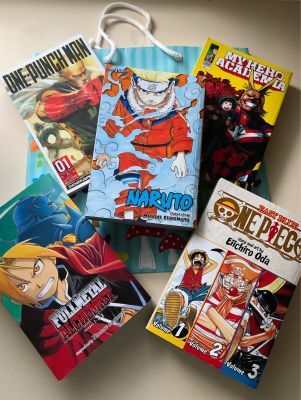 Whether you are already an avid Manga reader or have never heard of the word "Manga", these books will not disappoint you. 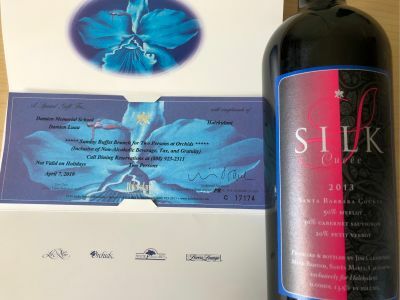 Description: Are you a tequila lover? 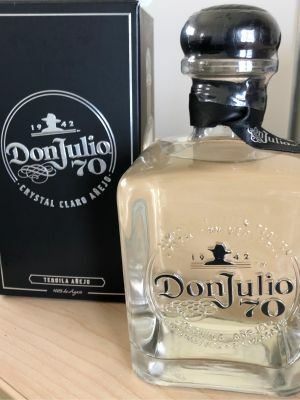 Then this is for you - a limited edition Don Julio 70th Anniversary Anejo Tequila. Description: Are you a fan of everything Disney? 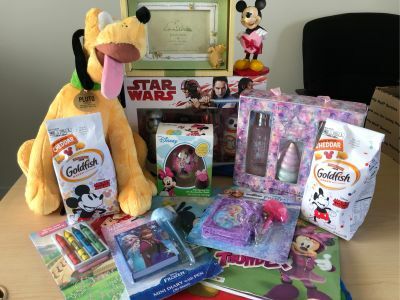 Then this one's for you, including a plush Pluto, coloring books, mini diaries, Starwars body wash, snacks, Winnie the Pooh photo frame and more. 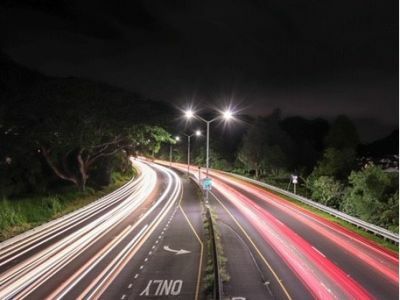 Description: Passionate about your car? 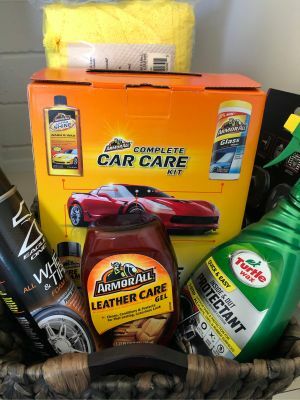 Here's everything you'll need to keep it looking clean and shiny! 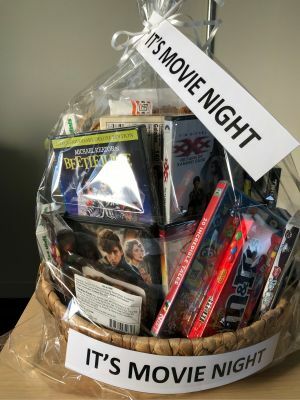 Description: This popcorn bowl contains a FireProof DVD, $20 Dominos gift card, $5 Safeway, snacks including popcorn, candies, mochi crunch, and chips for a fabulous Fireproof night! 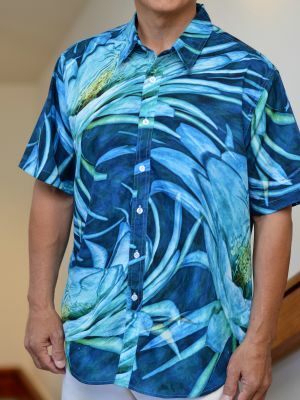 Description: Try this 'night blooming vision' design, men's aloha shirt, size 2XL from the Robert James Collection. 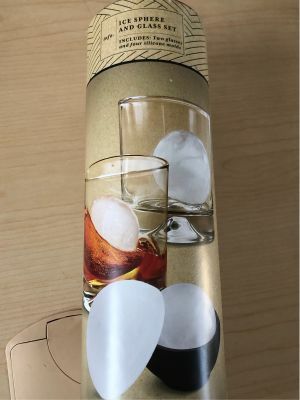 Description: Keep your coffee warm with this Tiger - Sahara Slim stainless steel insulated bottle. 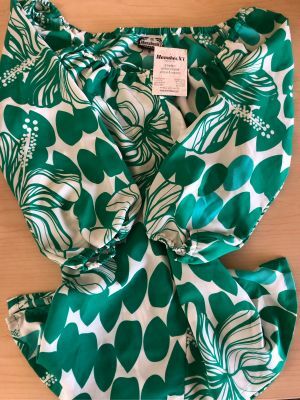 Included is a Starbucks gift card for $25. 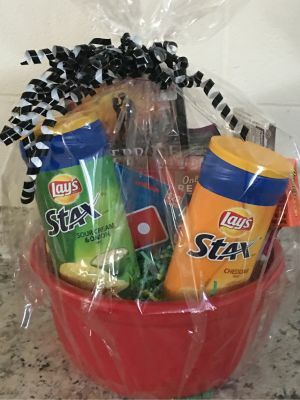 Description: Love pizza? 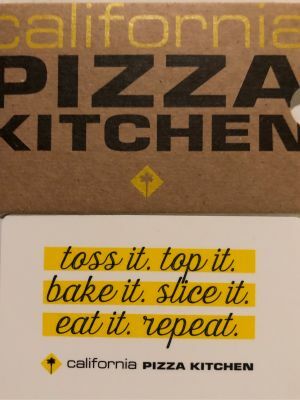 Bid on this California Pizza Kitchen $50 gift card. 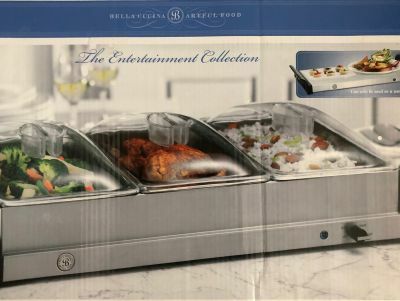 Description: Bella Cucina - Triple buffet server which can also be used a a warming tray. 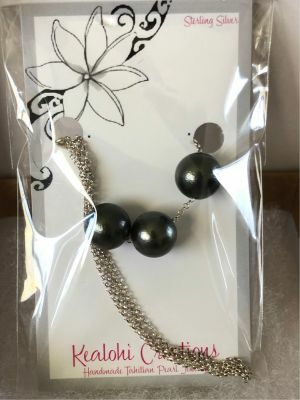 Description: Tahitian pearl earrings in 14K by Malacologie. 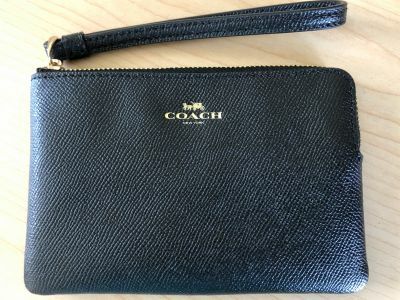 Description: Black leather wristlet accessory by Coach. Useful for holding small electronic or mobile devices. 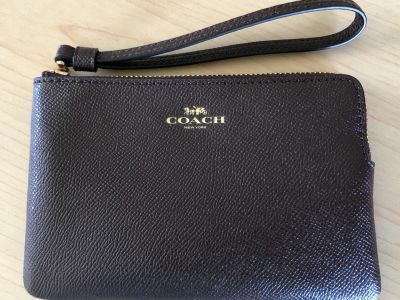 Description: Brown leather wristlet accessory by Coach. Useful for holding small electronic or mobile devices. 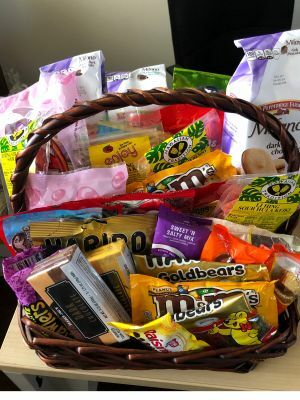 Description: Take home this basket full of Japanese and Hawaiian snacks! 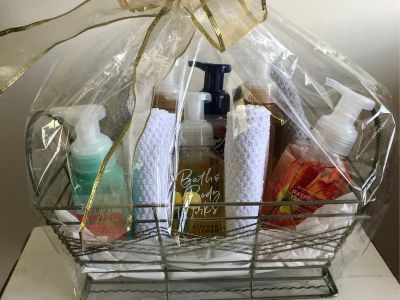 Description: Enjoy this fragrant set from Bath & Body Works including wash cloths and wire mesh basket to keep it in! 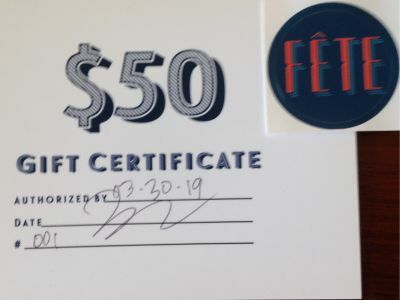 Description: Enjoy a meal out with this $50 gift certificate from Fete restaurant. Description: Craving pizza? 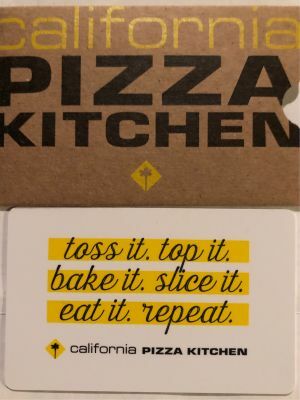 Bid on one of two (or both) California Pizza Kitchen $50 gift cards. 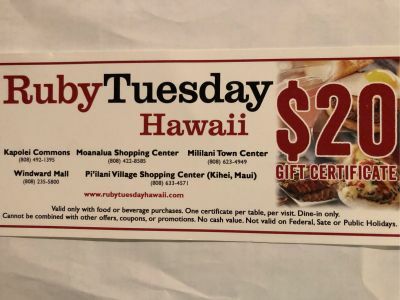 Description: Enjoy a meal at Ruby Tuesday, Hawaii with this $50 gift card or use it towards having an event catered. 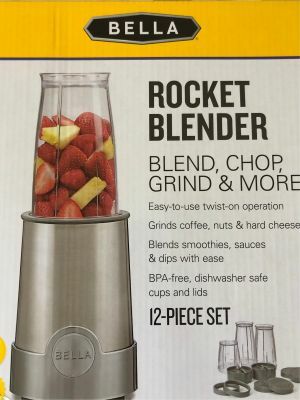 Description: Blend, chop, grind & more with this 12 piece rocket blender from Bella. 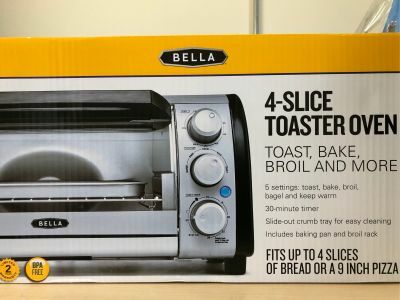 Description: Toast buns, bread, bagels and more with this toaster oven from Bella. 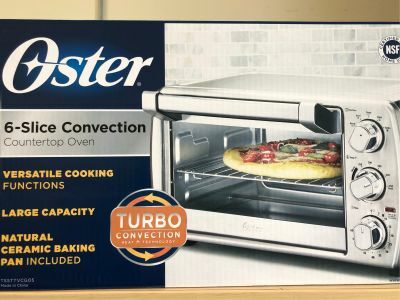 Select toast, bake or broil modes to have food ready fast! 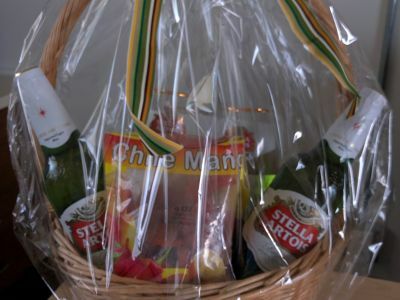 Description: Enjoy these two large bottles of Belgium lager and matching Stella Artois beer glasses with 4 of your friends! Included is a family pack of chili mango. 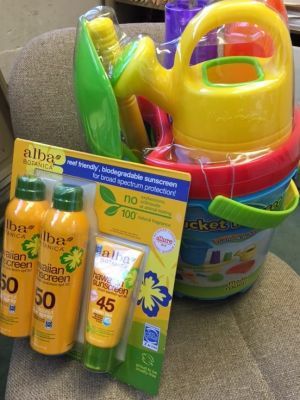 Description: The ultimate bucket playset for sand and water fun! Combined with reef friendly sunscreen to protect your skin. 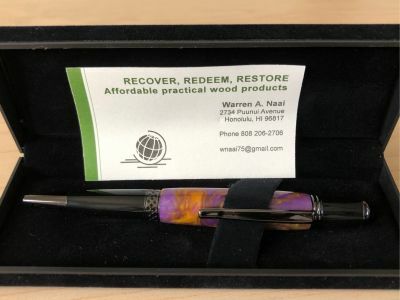 Description: Mesa style marbleized mauve and gold pen with graphite trim made by one of our alums. 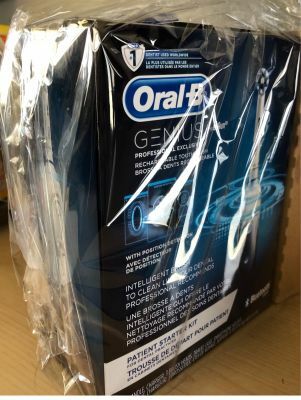 Comes with velvet protective box. 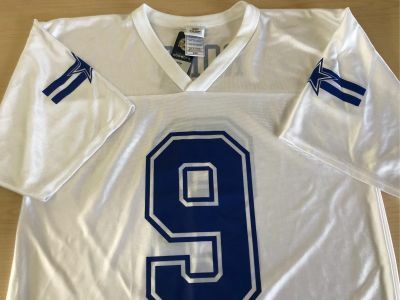 Description: NFL Authentic apparel, Dallas Cowboys, #9 Tony Romo, white jersey, size medium. 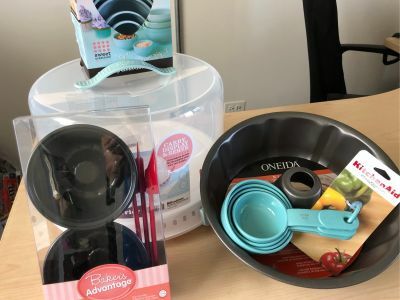 Description: Get baking with these measuring cups, bowls, utensils, molds and deluxe cake carrier. 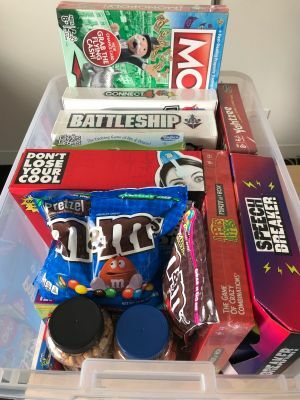 Description: Need to stock up on supplies? 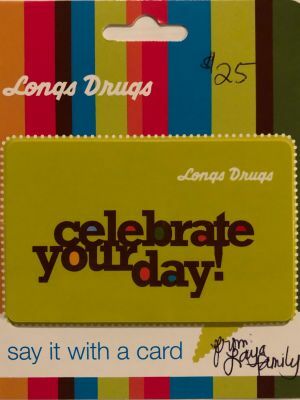 Use this $25 gif card from Longs Drugs. 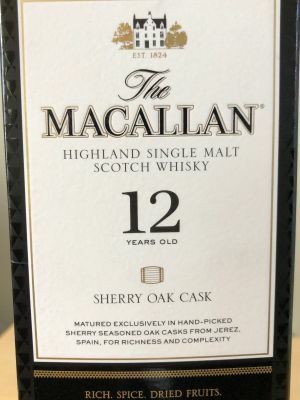 Description: For your next party! Wind & Willow Roasted Red Pepper Dip Mix. Paired with spreader knife and dip dish. 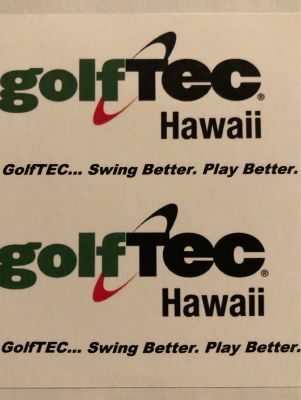 Good to go! 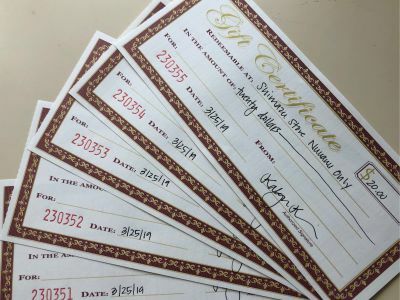 Description: Enjoy one of five $20 gift certificates of shave ice at the Shimazu Store, Nuuanu! 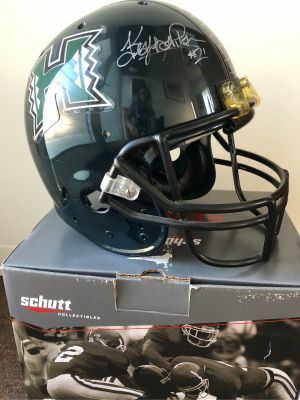 Top 5 bidders win! 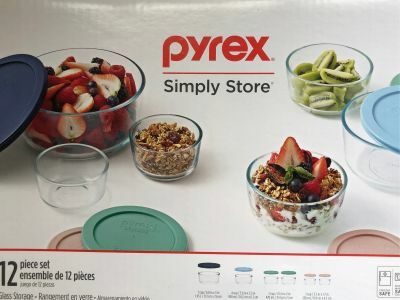 Description: Store all types of foods in this 12 piece Pyrex glass storage set. 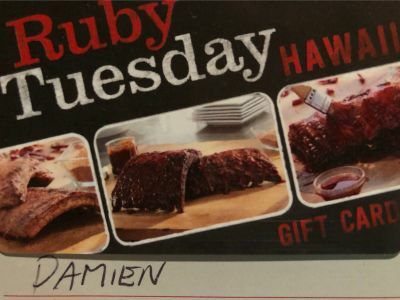 Description: Dine out with this $20 gift certificate from Ruby Tuesday.